West of Hell, Divinity, Without Mercy, All Else Fails and more! Semchuk Productions, Jurassic Ink Custom Tattoo, Metal Nation Radio, Prairie Fire Events, and Asher Media Relations are proud to announce the return of this year’s 2016 Loud As Hell Heavy Metal Festival V in Drumheller, Alberta at the Dinosaur Downs Stampede Grounds. Moving into its fifth consecutive year Loud As Hell Heavy Metal Festival promises to be bigger and better than last year with three full days of face melting metal from July 29th – August 1st in the heart of the Alberta badlands to showcase some of the country’s most talented bands with this year’s lineup that includes Unleash The Archers, Striker, Into Eternity, Ninjaspy, Divinity, West of Hell, Disciples of Power and more! (full list below). Being one of the biggest metal shows in Western Canada with onsite camping, vendors, tattoo artists, suspension demos, guitar and drum clinics, models and everything else that the big guy probably doesn’t approve of… Yes it’s Loud As Hell! So bring your earplugs and get ready for over 30 bands playing over 3 days. The festival has hosted artists such as Kill Devil Hill, Three Inches of Blood, Protest the Hero, Kenmode. 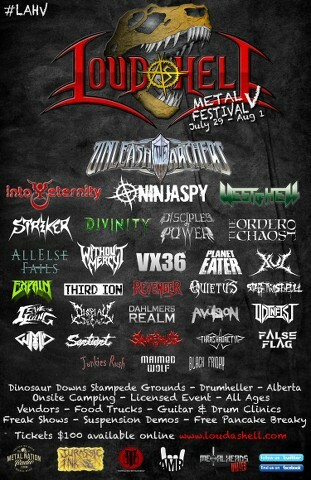 Organizers are excited to bring even more Canadian Metal to Western Canada! Friday, July 29 – Sunday, August 1. Loud As Hell Metal Festival in Drumheller, Alberta, Canada is celebrating year 5 in 2016!. As always the festival takes place over August long weekend from July 29-Aug 1. We’ve got our best lineup yet, ready to melt your face and kick off our biggest festival to date. 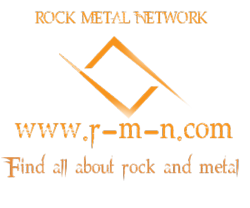 Featuring over 30 of the top Canadian metal bands you won’t want to miss any of it. We can’t forget about our freak shows, burlesque dancers, clinics, vendors and dinosaurs! 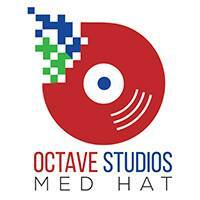 Stay tuned to this site for all the details to come!